The Mariners again bombed the starting pitching of the Red Sox, who left town 1-3 and lucky to have the one win. All hail the kings of March. If you are puzzled about the Mariners’ first week, imagine how it must be for the Red Sox. They came to Seattle as defending world champs, then stumbled out of town with pants below, well, their red socks. Had the Mariners not trotted out an injured reliever Friday night, Boston would have lost all four games. More galling, the Red Sox lost Saturday despite a Mariners defender making errors on three consecutive plays in the ninth inning, followed by a defeat Sunday in which Seattle relievers gave up four walks in the ninth. Whether these horrifying baseball moments are anomalies or trends for either team is unknowable. It’s not even April, fercripesakes. But when you don’t do Octobers, the Mariners will take what they can, however awkward the appearance. The Mariners collectively are Mr. March. Bring on the blood-pressure meds. It seems to be true. In the 5-1 start, the Mariners have scored 48 runs, including 15 home runs and 30 extra-base hits, the latter a club record through the first six games. It was done mostly against one of MLB’s premier starting rotations: Chris Sale, Nathan Eovaldi, Eduardo Rodriguez and Sunday’s slappie, Rick Porcello (nine runs, six hits, four walks in 2.2 innings). The 34 runs against the Red Sox were one shy of the home record for a four-game series. For only the second time in club history, they have homered in each of the first six games. The record is eight, set in 1998, with guys named Junior, A-Rod, Edgar and Jay. It’s amazing the slack that is created when a team starts with a pace that would generate more than 400 homers this season. For perspective, the Yankees set the single-season MLB home-run record last year with 267, three more than the previous mark by aforementioned blacksmith-forearmed Seattle guys of 1998, blessed with the bandbox dimensions of the Kingdome. So while pace can’t continue, the offense at least capable of this sort of tonnage on occasion can cover for a lot of failure elsewhere. The Mariners knew going into the season that the bullpen was the roster’s weakest link, and the defense would be below average. Both have become worse because of injuries — 3B Kyle Seager is on the 60-day injury list after finger surgery, and nominal closer Hunter Strickland will be out at least two months with a strained lat, according to manager Scott Servais Sunday morning before the game. Both vulnerabilities came into play over the weekend. Ryon Healy at third base made a throwing error in the fourth inning that led to two unearned runs, bringing the Sox back into the game after the Mariners’ seven-run third. 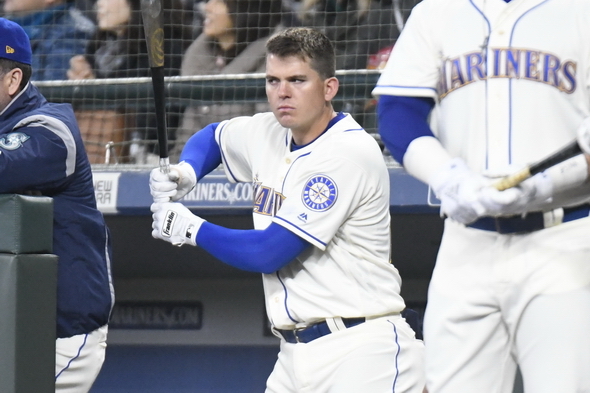 Seager’s replacement Saturday, rookie Dylan Moore, committed three consecutive errors in his first major league start, which allowed three runs, turning a 6-2 lead into a Wallenda wire walk before prevailing, 6-5. In the ninth Sunday, trying to protect a 10-7 lead, reliever Cory Guerrin walked three to load the bases with one out and was pulled. His replacement, Chasen Bradford, who hadn’t pitched in the series, walked pinch-hitter Blake Swihart to force in a run, then struck out Christian Vazquez. With everyone among the 33,391 at T-Mobile Park on their feet, including a considerable number from Red Sox Nation, No. 9 hitter Jackie Bradley Jr. was induced to ground out to second baseman Dee Gordon, the Mariners recording a second consecutive successful deployment of late-game disaster drills. Cushion for lameness was created in part by a three-run homer from C Omar Narvaez in the third and a solo shot on the fourth by 1B Jay Bruce. Five Mariners had two hits: Bruce, Narvaez, Healy, Gordon and Mitch Haniger, and as a group the Mariners collected seven walks. With a double, single and walk, Healy is hitting .360 and seems much more productive. At least early, the Mariners appear to have a number of tough outs. If they continue to create three- or four-run leads going into the ninth, they may have just enough to make fans forget Edwin Diaz. Edwin Diaz will be forgotten “the day pigs sprout wings”…and no, there will not be “pork in the treetops come morning” (‘The Lion in Winter’). So his departure in order to unload Robinson Cano’s contract won’t be enough for you? You’re not hip to the practice of cannibalizing assets. Oy, that bullpen…I wonder if Bobby Ayala is available? Fernando Rodney? Heathcliffe Slocumb? Sure. Make the easy joke. Nobody remembers J.J. Putz. Heck, I remember Rich Bordi. For a good chunk of a whole season my wife thought Norm Charlton had a different first and middle name . . . not really, but toward the end, he would blow a save situation and I would yell “G__ D___ Charlton” and she almost got used to it. I’m not proud of these words, but Norm’s career went on a little too long. On the other hand, Ed VandeBerg would routinely have 60 or even 70+ appearances, being the setup man for Bill Caudill and the Mariners were mildly entertaining then. IF the Mariners were going to win a game, there was nearly a certainty that Caudill would close out. The sacrifice of Diaz was significant, but if his talent would be wasted, as was Felix’s in his prime, on a futile team, I see the point in the trade. But if the goal was to tank in 2019, the plan is starting off poorly. If they keep it up, maybe they could get him back. On the other hand, Edgar Martinez ate Mariano’s dinner and stole his next day’s lunch money. Edgar faced Mariano Rivera something like 23 times and hit .579 with 3 doubles, 2 homers, and a bunch of walks. Perhaps Edgar’s single greatest feat. No, Diaz won’t be forgotten but you can’t convince me that, with this type of offensive production, the M’s are in a rebuilding year! Can I convince you it won’t last? Probably, sadly, you won’t have to. But maybe not till September! Mariners master plan may be endanger. Success is always a threat to spoil mediocrity. Talk to me in May. We talked to you in early July, and you believed then, right? Art – I just might have to eat my words, and gladly. The fans deserve some fun and hope and these guys are showing they are a talented, cohesive team. I might even buy a ticket! And if I need to pay off our “10 games up at labor day” bet, I will do so with gusto! Imagine with Diaz they would be undefeated. Not if it meant having to keep Cano and putting Gordon in the OF again.